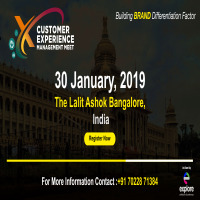 Unite with us at “CUSTOMER EXPERIENCE MANAGEMENT MEET” slated on “30 January, 2019” at Bangalore,India. To learn from the leaders of the world about their customer experience strategies across all channels and touch points to efficiently evaluate the Voice of Customers (VOC) in turn implementing the best strategies and technologies to drive their business momentum. Get on board and scale your capabilities to get proactive and attentive approach rewarding you with exceptionally satisfied customers like never before. • Market Specific Conference Sessions- With the help of senior executives we have crafted a very fine array of sessions reflecting strategic issues that have been identified as priorities. • Cutting Edge Insight- Connect with the fraternity of leading minds in customer experience to get more inputs on the latest updates, techniques and solutions trending around the globe. • Customer Centric Approach- Get enlightened on where you are on your CX roadmap and set a plan of action for progression. • Networking Opportunities- Make some new connections! Swap some business cards and get your face out there in our networking breaks. • One-to-One Business Meetings: A unique platform offering 30 minutes of pre scheduled business oriented meetings with specialists, whose industry knowledge and experience enable valuable contribution to the requirements of your business, understand their capabilities and align on potential collaborations. •	Recognizing Voice of customer (VOC)- Discover key strategies to listen actively and turn the voice of the customer into actionable insight. •	Creating Consistent Communication-The meet will discuss how to realize the customer touch points and give them unified experiences in an Omni channel environment. •	Understanding customer’s ecosystem and journey- Learn the new science of customer emotions and harness the powers of various metrics to identify the right indicators for success. •	Analytics to rescue- Craft an end-to-end customer experience by leveraging analytics to predict and anticipate customer behavior. •	Brand Authenticity- Empowering the role of CRM (Customer Relationship Management) to provide personalized service in turn delivering relevance and value.